With a fourth ride guide under his belt , Motorcycling Through Western Oregon, we sit down for a candid interview with the author, Tom Mehren. Your introduction to the book primarily covers most of the design on the cover. Why was that so important to discuss? TM: This is simply one of the hardest covers I've ever had to develop in the series. Western Oregon doesn't have volcanoes (we consider them Central Oregon), giant mountains or other strata to define it. It's a unique geography to be sure, but you can't sum it up in a single shot. For me �riding around, slinking into the next corner and coming out is what it's all about. So I placed what I thought was the epitome right on the cover. A local rider enjoying a day out, some farmland and Lobster Valley Road. You don't go to Oregon and miss Lobster Valley Road. The first chapter is a series of discussions. Do you think anyone cares? TM: While riding through the area , I wound up with all these questions . Who made this? How do they maintain the roads? How did the roads come to be? What's going on here economically that's making these roads so great? It went on and on. I figured other riders are going to have these same questions. Eventually I realized we need to have these discussions. And you know how it is with motorcyclists�one guy does all the talking while the rest just listen�so here I was doing all the talking. Babble, babble babble	� b ut seriously, doing the research on this was informative to me and hopefully it will be to the readers too. You actually promote a section of I-5 as a great road. Why? TM: Right. The section between Roseburg and Grant's Pass. It's part of the Applegate Wagon Trail. Turns out what was good for the goose was good for the gander! Like the section of I-84 between southeast of Pendleton into the Blue Mountains. You do that in a car and you know you just gotta go do it on your bike. Ditto here. If you haven't done either on your bike, it's time you did. You live in Seattle. Do you think you spent enough time riding the roads there? TM: No. I w ish I had a few solid decades to do that. I wouldn't mind living there and riding them over and over. But the book takes its own form. It's me out there digging in and finding this stuff , so those with precious time get to enjoy it without burdening themselves following RV traffic up 101. The rides come in four flavors. You include a description, turn-by-turn directions and a map, and if someone wants the GPS files they can get th ose too. Wouldn't one or two solutions suffice? TM: I've been doing this long enough to know, humans don't all work the same way. My personal choice is maps and GPS. Others like turn-by-turn and I've learned a lot is gained in the descriptive. Now , if you put them all together , what could possibly go wrong? On Oregon back roads still a lot! OK, that's why we also make the GPS available. I could not have completed the book without the GPS files I wrote in advance. The Steinman Overcrossing is the equivalent of a freeway onramp from the aerial photo in the book. Why is it such a big deal? TM: For starters it's not on a freeway. Secondly , it's a bizarre moment for anyone who has some directional ability to imagine that they should be turning to the right when instead they're going to make a left, but what kind of a left? A FAT left. And who in their right mind designed a road this way back in the 1900s? None other than Sam Lancaster and Sam Hill, who happened to be the creators of US 30 from The Dalles to Portland. That is major road making history. You had a terrific bee sting during the pre-ride. Tell us more about that. TM: I didn't include it in the book because it had nothing to do with it , really. On the second day during the final pre-ride segment, I hit the campground east of Ashland at Hyatt Prairie. After taking off my glove I realized a bee had nestled his way between the gauntlet and my sleeve. When he h it my flesh he dug in deep and gave me a nasty bite. Not a big deal until two days later when my hand swelled like a blowfish. My doctor said 'keep your hand elevated' which was a joke since I had another five days of riding to go. It finally receded after about two weeks and now I need to carry an epipen. Christmas gift, hint hint. TM: It has to be the Blue House at Vernonia. But I knew about the place when they had their spot to the north , west of Mist. A great little Greek place that has now found a better home and expanded their offerings. If you gave me two choices I'd also add Railroad Avenue Station. The coffee is fine, but the cheesecake is to die for. McMenamin ' s comes up several times in the directories. What's your take on their empire? TM: Local corporate megalomaniacs! We love these people. They make things more magical every time you stay at one of their places or dine with them. If you're tired of giving your money to outside corporate monsters who are sitting on their/your cash, spend it with these guys locally. Honestly, we missed a few places that should have been included like the Grand Lodge in Forest Grove. McMenamins has always been a good partner in our book distribution, ever since we released our Gorge book to the masses in 2006. What about 101? You skipped it. TM: Purposely. No doubt, it's a great road. Even better if you ride it outside of the months between Memorial and Labor day. But all you need is a paper map or less to go up and down it. I figure most folks will hit it at some point anyway. My job was to get them to it and get them away from it when they were ready , and the book does that pretty well. What's the big deal about crediting the printer and the bindery? TM. When we began publishing books through Mixed MEDIA back in 2004, we used local printers. In 2008 it was suggested to me that we start looking at using China as a publishing destination. While it would have been cheaper, there were three things that didn't appeal to me. #1: Turnaround time would have been longer. #2 : It doesn't put money back in the pockets of people nearby and #3 : I f there was an issue in the final output how well could we deal with that? We're at an advantage from all three points when we publish locally. Gorham Printing in Centralia does a great job printing our book and the output on this one was stunning. Rose City Bindery in Portland uses an elongated-tip-and-bend process on the spiral bind, so the book won't unravel on the first day of stuffing it in a tank bag. This pair of entities can print and deliver in less than three weeks. From China, the shipping time alone would be three weeks. Will the book be released on Kindle? TM. As you may know, we've started testing with kindle, but not on tour books. I'm not opposed to it. We're going to test that this coming spring. The food descriptions are tough. What does it take to please your appetite? TM: The food has to be good and good for you. That's not often the case when you're out on the road. My preference is to eat nuts, dried fruit and beef sticks, getting a slice of cheese here and there and some fresh fruits and greens when I'm riding alone. But you're gonna want breakfast, lunch and dinner at some point. We can subject ourselves to junk food all day long and all we'll do is feel bloated, crap funny and die sooner. Riding motorcycles is fun , and the longer I can do it the better. I'm passionate about good food, so consider it two books in one and enjoy sharing the good places that are out there with others, even if they don't ride. My sister lives in Grant's Pass so the tip on Nano's just up the road in Glendale was a fun one to divulge. We both love Mexican food. Who the heck is Emily Mercer? TM: It's a secret. She puts up with me and my maniacal stuff day in and day out. The tidbit in the book about wanting a Quarter Pounder with Cheese at 11 am is real. I wanted one, I called her on her cell in our warehouse, she dropped everything and brought it to me. Must have made for a funny story when she got home that night about what a goofy crazy person I am. I put her to work on the See and Do directory and she found stuff I didn't even know about. Western Oregon is an awesome place. You credit Fox Mulder and Dana Scully with back office antics. These were the stars of X-files. Why do you credit them in so many of your books? TM. Wrong. The stars of the X-Files were David Duchovny and Gillian Anderson, who played Fox Mulder & Dana Scully. The two cats here at media central are the real thing. 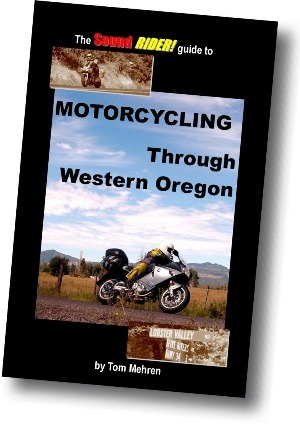 Motorcycling Through Western Oregon is available now from the Sound RIDER! store and finer motorcycle stores in the Northwest. To purchase a copy or locate a dealer with it for sale CLICK HERE .